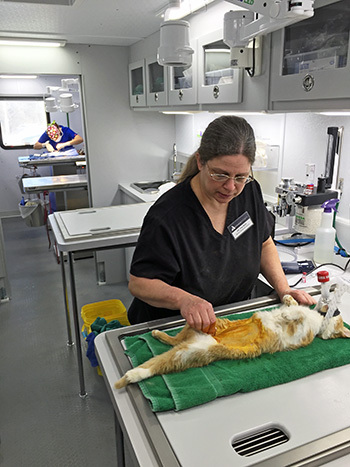 In January 2015, the college’s shelter medicine program hit the road in style with a new mobile surgical unit funded through a grant from PetSmart Charities. The $323,000 grant, received on October 23, 2013, also covers expenses for supplies and funds an intern veterinarian and a veterinary technician. In the first year with this funding, students in the shelter medicine rotation doubled the number of animals sterilized, from about 1,500 animals in academic year 2013, to 3,000 animal sterilizations in AY2014. Students in the program routinely perform fifty solo surgeries during their veterinary studies. “This grant allows us to provide a no- or low-cost sterilization program for area shelters,” said Dr. Bob Weedon, director of the shelter medicine program. Inside the mobile surgical unit are two spaces for surgery and two spaces for surgery prep (foreground). The grant makes it possible for more students to get more surgical experience and more animals and their owners to benefit from pet sterilizations, which are goals that PetSmart Charities aims to achieve. 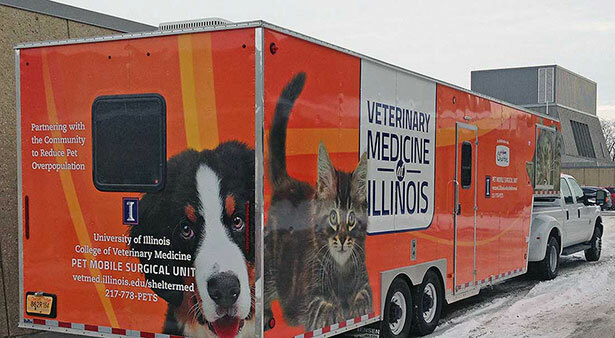 Dr. Weedon’s long-term goal for the Illinois shelter medicine program is to establish a residency to provide specialized training for veterinarians entering this field. Shelter medicine recently received provisional recognition from organized veterinary medicine as a unique veterinary specialty concentrated on improving the health and well-being of animals that live in shelter environments. 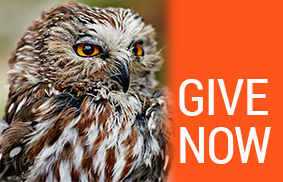 Financial contributions to the Illinois shelter medicine program are still needed. To find out how you can help, call the advancement office at 217-333-2761.